This one’s hard to weave in words. It is as if i am outsourcing this blog to my inner consciousness tangled in ‘D’ for dilemma, ‘D’ for delusion. So here i am, after almost 9 months since i posted last. The time it takes for a zygote to come surging out of a woman in the form of another living flesh and bones. Before this turns into a really distasteful metaphor for my metamorphosis, no such thing happened, i dint have a transformation, nor did i inject myself with Botox and self-help books. There were no endless selfies aesthetically shot at beaches and mountains to document my solitary spiritual #wanderlust. I am still the same old growing cellular organism with increasing mood swings and an ever increasing wardrobe and a face that could explode if i have another one of them Magnum ice creams. Damn you ‘wont let you fit into that body-con no more’ on a stick! This ones about the uneasiness that comes from staying at one place, doing the same thing, being the same person, loving the same things. It is the urban disease i’d like to take the creative license to call-‘Spirit Architectural Disorder’ and the acronym coincidentally is ‘SAD’. Everybody comes with a blueprint personality and spirit, over which we meticulously and more often than not accidentally, lay brick-by-brick our desired attributes, passion, dislikes, beliefs, friends, soulmates etc. As time goes by, our blueprint takes the shape of a living structure embodied by our personality. Now the problem with structures and buildings is that they are immovable. They are strong, and majestic and unique, but immovable nonetheless. So once built, it is extremely hard to dislodge from the countryside to the badlands. And it is equally hard for the people in your universe, sharing special rooms in your spirit archaeological structure, to understand the tremors every now and then. But there will come a time when the coastal typhoons will find itself challenging your foundation, and at first it may confuse you. But it is that breeze, that maddening zest that you had closed your windows to and built your fences for, it will be the cacophonous rain on the terrace of your eyes, and it will be red that will bleed on the walls of your heart. At this moment, when the tremors will get treacherously loud, the occupants of your monuments may blame and lampoon and choose to desert you, but fear not. Maybe the allegory is confusing, but the people who find themselves constantly unearthing new pots of gold and dirt in the pits of their soul will know. This disorder i speak of is nothing but the challenge and acceptance of the new secret doors in you. A new passion, an old feeling, a frozen tear, hidden bucket list, a new first kiss, a bewildering dilemma, an unread letter, an easy mystery, a savory sadness, a colorful madness. Often people will tell these people that they are’unstable’ or ‘fickle’ or that ‘they don’t focus on one thing’ or even ‘confused’ but the fact of the matter is that they sleep with their windows open, unafraid of what might fly in and decide to stay. 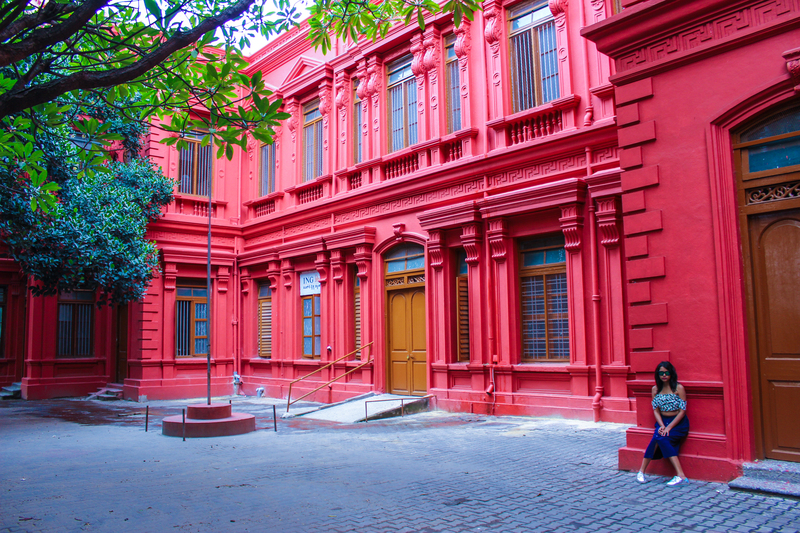 At 7 in the morning in Bangalore, city still groggy, I was wearing my blues looking for some colors to unburden my off-shouldered shoulders, the lonely red walls reeling me in. I found this building tucked away on the roadside and called itself the ‘CIVIL COURT’, but in that moment, on that morning, it was me. Editor: My one only cutie Kavita Gupta. Follow her beautiful travelogue on Instagram. eee…i finally saw your comment! thank you birdie. :* glad you like it!